Mobile teams can now fix technical issues in their computers with a single reboot. Avoid delays in field operations by fixing issues instantly. Protect servers from virus, spyware, rootkits, ransomware and unwanted changes. Protect critical data by maintaining a clean system with pristine configuration. Erase sensitive data with a reboot and stay compliant with state and federal regulations. Fix issues with multi-user systems with a single reboot. 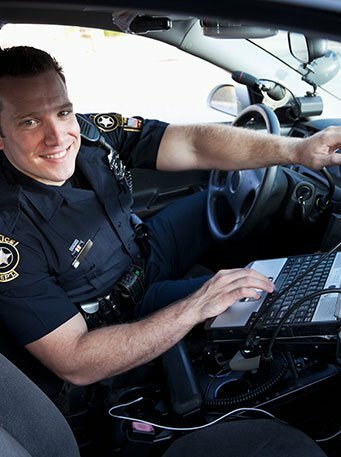 Ensure 100% uptime for first responder systems and eliminate the delay in response due to computer downtime. Reduce IT costs to fix, update, and maintain computers across your organization. Preserve configuration in its pristine state and avoid computer downtime. Protect, secure, update, deploy, and manage computers across multiple locations from a browser. Create secure citizen service kiosks by allowing only specific applications to run. The LAPD decided to deploy Faronics Deep Freeze, an instant system restore solution that restores the MDC to its original configuration with a simple restart. To lock down computers and ensure officers focus on their patrol duties only, the LAPD implemented Faronics Anti-Executable. As a security solution, Anti-Executable allows the LAPD to restrict any unauthorized applications and malicious executable files from installing and running on the MDC.